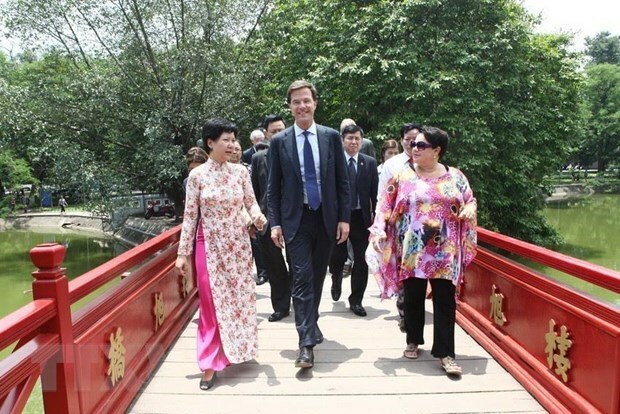 Hanoi (VNA) – Dutch Ambassador to Vietnam Elsbeth Akkerman has stated that the upcoming Vietnam visit by Dutch Prime Minister Mark Rutte will affirm the importance of bilateral partnership between the two countries in a modern context. In an interview recently granted to the Vietnam News Agency, Akkerman said the Dutch PM will be accompanied by the Minister of Infrastructure and Water Management; Deputy Minister of Agriculture, Nature, and Food Quality; and over 100 businesspeople from 70 Dutch firms. Since the two countries established bilateral diplomatic ties in 1973, their key cooperation areas have covered agriculture, food security, water management, and climate change. She said the Dutch government has pledged to achieve sustainable development goals, especially in climate change. According to her, the two PMs will discuss the issue during their meetings. The ambassador said that water management and agriculture are the most outstanding cooperation areas between both sides. Notably, the Mekong Delta Plan – which was compiled and launched by the two nations’ governments, research institutes, and localities – is a shining example of this. Based on that, the Vietnamese Government issued Resolution No.130 on the sustainable development of the Mekong Delta visions to 2100. Regarding cooperation prospects, she lauded maritime navigation as a promising area. The northern port city of Hai Phong and Ho Chi Minh City are both home to large-scale facilities for shipbuilding, port management, and inland waterway transportation. The use of inland waterways instead of roads can help mitigate environmental pollution. She said the Netherlands is studying smart transportation modes that are suitable for Vietnam to ease pressure on the environment. As the European country is experienced in urbanisation solutions, it also seeks cooperation opportunities with Vietnam and major cities such as Ho Chi Minh City and Hanoi in connectivity and subscription services using smart technology, she said.